Rewards are sweet for voting this year, especially for social media participants. 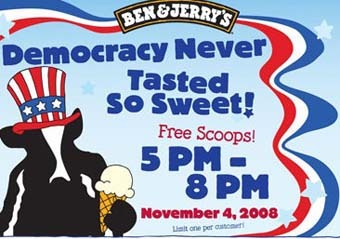 Ben & Jerry’s scoop shops will be giving out free scoops on November 4th from 5-8pm to “celebrate democracy.” The company has more than 289,000 fans on Facebook, where it lists its election day events and has an interactive map showing where your nearest store is located. And if you show Krispy Kreme employees your “I Voted” sticker on Election Day, you’ll get a free star-shaped doughnut, according to NPR.